This evening we went to Jan and Doc's for Jaden's baptism. He was baptized in the lake. Kind of cool. We were there for a few hours with all kinds of out of town family. We all enjoyed our time there. I had the camera in my pocket figuring I'd get a potd there. Well...the camera never saw the light of day. We came home and I thought, Great, now I'll have to search around to find something to shoot. I wasn't having an easy time coming up with anything either. Kade had heard me say I needed to find something. Then two minutes later I hear, "Mom, it's a rabbit! That can be the picture of the day!" I love that he tries to help me with my problems. 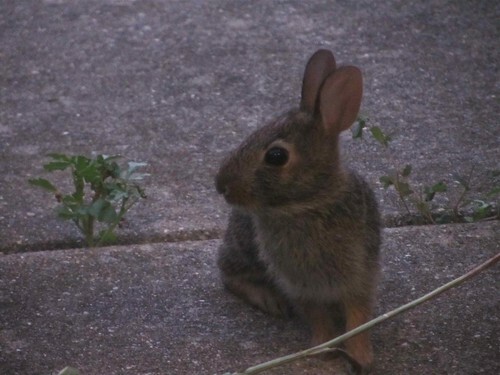 I went to see what he was talking about and there was a little baby rabbit. I gave in and took the picture, figuring it would be that or my pretty toe nails. Then I began to think about it and we don't really see a lot of rabbits around here. At the old house there were a few families of them. They would jump and run around chasing each other. I do miss that. They were fun to watch. I would trade the dumb crows for the rabbits any day.